Over 390 Lots of Western Americana are up for auction on iCollector.com on Saturday June 22nd, 2017 from New Frontier Western Auctions. This wonderful auction includes a large assortment of highly collectible pieces that are both quality and rare. 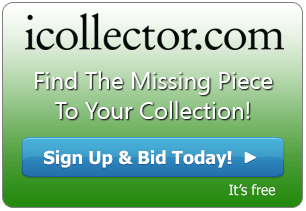 Items in the auction span many categories and will be a pleasure for any type of collector. The catalog features Western Art and Collectibles, antiques and modern wars, as well as many high-end collector items. The auction begins at 1PM Mountain Time from Loveland, Colorado and absentee bidding will be available right through until the live auction. 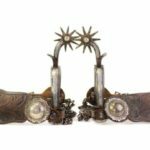 One of the most beautiful pairs of spurs in the auction are featured at Lot 215. 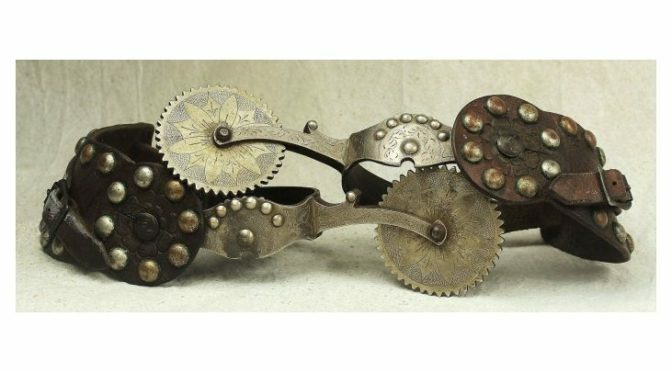 These are huge Visalia Style Spurs that are a magnificent pair of single overlaid spurs. They have beautifully engraved silver and domes, as well as set off by incredible huge saw tooth silver overlaid rowels. This is an unmarked piece, in a classic style known as the Visalia pattern. They are also accompanied by a great pair of straps. They are estimated in value from $4500 to $8000 and there is a fantastic photo for viewing in the online catalog. This is a spur collector’s dream piece. Lot 221 presents a fantastic Keyston Bro’s Silver Saddle for bidders to view. This is an eye dazzling and uncommon brown and silver mounted 14 ½” show saddle. It has engraved bucking horse corner plates, a large dome concho perimeter, and an engraved silver horn cap. In addition, there are 20” long tapaderos. It is fully flower tooled and having a light color and is in fine condition. Estimated in value at $2500 to $4500, there is going to be a very satisfied winning bidder. Lot 224 is one of the rarest pieces of the auction. Here is a rare Plains Eagle Dancer Doll that bidders can grab with the highest bid. 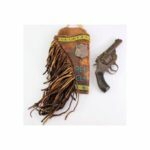 This is a pre 1900 made from tanned buffalo hide, is beaded, and adorned with hand fashioned fringe work. 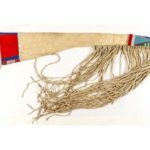 The doll features early bead colors to include greasy yellow, apple green, rose white hearts, red white hearts, cobalt blue, and there are white beads in the loin cloth. In addition, there are leggings, moccasins, a head, and a dimensional beak. This exceptional and unique doll measures approximately 13 inches in height and is a compelling example of early Native American Plains art. Estimates are $4500 to $5500 in value. Each lot has a quality photo and extensive description available to look at in the online catalog. 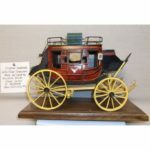 New Frontier Western Auctions and iCollector.com are excited to present this auction to highlight the summer. Questions can be sent to the auctioneer through the website or by telephone, and industry leading service will take care of all bidder needs.